Thanks to Helen Lowe for her patience--she has waited a very long time for me to get to her novel, Heir of Night. If you will remember, back in January, I talked about doing a book exchange with Helen in this post. Unfortunately, due to several issues between my day job and my writing committments, I have been highly delinquent on my portion of the exchange and I apologize to Helen for this. Meanwhile, I've carved some time aside to read Heir of Night. 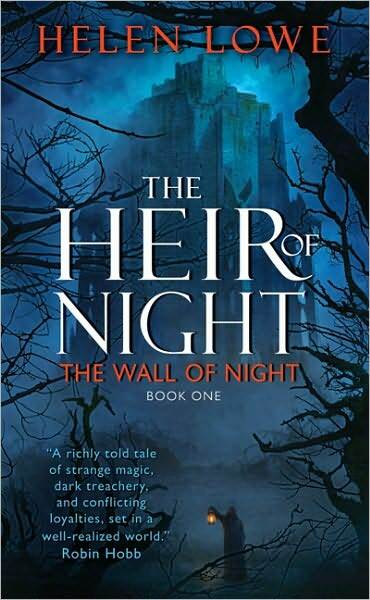 The Heir of Night is the first book of the Wall of Night series, which is a more traditional epic fantasy (think Brooks, not Abercrombie), a sub-genre that I don't normally gravitate toward; however, I wanted to challenge my reading habits in 2013 and try new novels and new authors. I never know when a novel will introduce me to a new way of thinking or bring me back to a sub-genre that I drifted away from, such as the more traditional epic fantasies that I enjoyed so much when I was younger. In The Heir of Night, Lowe tweaks the old tropes by giving us a female protagonist, Malian, a precocious young woman who finds that there is much more to being a hero than she first imagined. What interested me was how Lowe deviated from the traditional third worlds of epic fantasy with her backstory of the Darkswarm and the Derai. The Darkswarm and the Derai move across space to fight through the centuries on different worlds, a storyline that gives Heir of Night a science fictional spin. Lowe utilizes necromancy and other dark arts to give the novel the right touch of dread for epic fantasy fans--not so much as to qualify for horror, but just enough to send a shiver down your spine. Lowe keeps a firm grip on her world and her magic systems to deliver a well written, well told story, and I can think of no greater compliment to give to another writer. If you enjoy Tad Williams, David Eddings, and Terry Brooks, then you will definitely enjoy Lowe's Wall of Night series.